Today, the people of Yendi in the Northern Region are in a happy mood because of a historic moment – the outdooring of their new Ya-Na, Yaa Naa Abubakari Mahama. The ceremony which is ongoing at the Jubilee Park at the Yendi Senior High School has seen many dignitaries in attendance including the Former President John Dramani Mahama and the President of the National House of Chiefs and the Agbogbomefia of the Asogli State in the Volta Region, Togbe Afede XIV. However, one dignitary caught the attention of everyone at the venue including social media users – and that is President Nana Akufo-Addo. He reportedly arrived in Tamale on Thursday afternoon ahead of the investiture today. Touching down to a crowd of ecstatic residents and dignitaries at the Tamale Airport, the President responded with a firm fist in the air, a wave and wide smile. 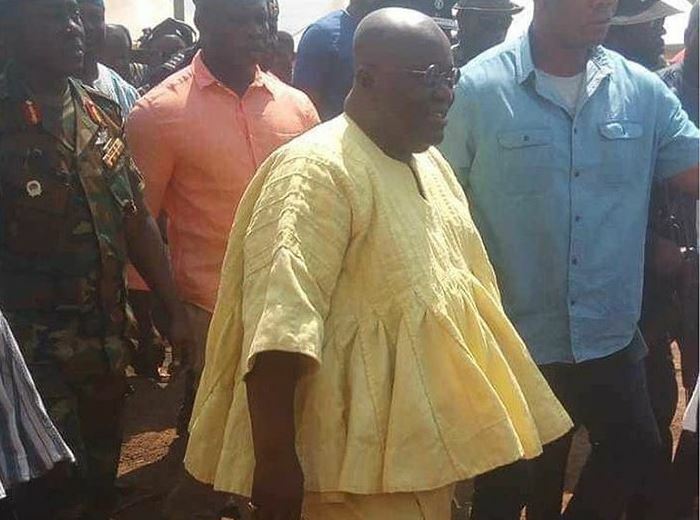 He stormed the event ground wearing Yendi’s native outfit – a cream smock and crimson boot. Upon hitting social media, the photo went viral and had everyone talking! Winner of 2018 Closeup Break The Barrier, Lycon out with "Where She Dey?"